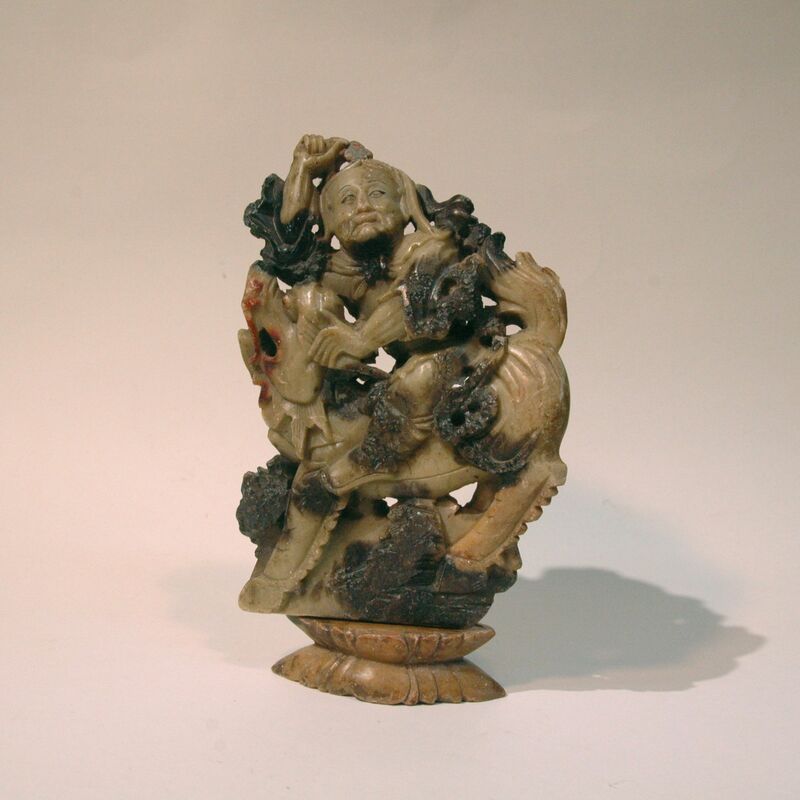 This figurine is a Shou Shan stone carving, the Shou Shan stone is famous for its wealth of colours, the artist would made use of the colour to form the composition of the carving work, all the carvings are one off piece of artwork. The warrior of this carving is riding on a Kirin (yes, its the same mythical creature as on the beer can) with bats accompanying them. The Kirin (together with the Phenoix, the turtle and the dragon) is believed by the Chinese to be one of the four old saintly creatures. Its a creature of heaven and not of the earth, those that were captured by the gods became their carriage (as on this figurine). The Kirin has the head of a dragon, horns of a deer, eyes of a lion, the body of a tiger, the scale of fish, but despite this fierce appearance it is a kind creature and believe to an animal of blessing. As for the bats, they are also a symbol of blessing for the Chinese but as we all know what they look like I wont go into details in this post. Here is a story about the bat and the kirin from the Ming dynasty which i find quite amusing; one day the Phoenix held a birthday party, as she was the queen of the birds all the birds from everywhere came to wish her happy birthday. The bat, however, did not show up. The Phoenix, being the queen, was not please at all, so she summoned for the bat and asked, “you live under my rule, where are you so arrogant and did not come when invited?” The bat answered, “I have craws, I am a beast, why should I pay my respect to a bird?” Then the Kirin held his birthday party and the bat did not show up, the Kirin was angry and condemned the bat, the bat answered, “I have wings, a bird, why should I come to a beast party?” Then the Phoenix and the Kirin met up and of course the bat incident came up in their conservation, “what a world this is coming to that there is such non bird non beast creature, how frustration is that.” As time moves on from the Ming Dynasty, I feel that the bats now would claim to be a bird in front of the Phoenix and a beast in front of the Kirin, a fence sitter in all sense.